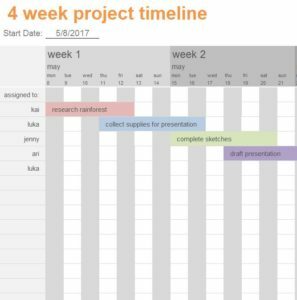 The free 4-Week Project Timeline is the unsung hero of the small business world. Whatever your project may be, this simple template can help you break down the information you have so you can carefully organize that data and get the project done in the most efficient amount of time. You might have struggled with a project in the past. After all, they take a lot of time and energy to complete. If you miss even a single step, you might find that your entire project is wasted or you have to do a lot of backtracking, which wastes both time and money. This free template document has all the tools to help you through your project and make sure you don’t waste a single second. To download the free template file to your computer, you can follow the link at the bottom of this page and open the file once it finishes downloading. Start by entering the name under “Assigned to” column and highlight the duration for that project member. By choosing the date above, the template will adjust the days of the month to fit your own timeline. Take a look at the example provided. You will have the names of your project team in the first column, the name of the task in the actual bar of the graph, and the status of the task in the last column of the table. You can begin by changing the names in the template to those of your actual staff. Then, change the names of the tasks and add new ones so they fit your own project. When a teammate completes the task, you can indicate that in the “status” section. Everything you need to complete your project is available on a single page. Give it a try by downloading the free template today!